SEATTLE - North American lumber exports (U.S. Northwest and British Columbia) to Asia have declined significantly since record level exports in 2013. From 2009 to 2013, the value of logs and lumber shipped over the Pacific Ocean surged from 1.7 billion dollars to 4.9 billion dollars. Since the record high in 2013, the total export value has fallen quite substantially and was just over 3.3 billion dollars in 2015. Customs data for the first six months of 2016 show a continued decline by 18% in the exportation value for Canada, while US exports were up three percent year-over-year, as reported in the Special Report in the latest issue of the Wood Resource Quarterly (WRQ). The biggest change the past year has been the substantial decline in Canadian shipments of softwood lumber to China because of sawmills in British Columbia directing their sales to the healthy US market. The export value for BC lumber shipped to China in 2016 is on pace to decline by 50% as was exported in 2014. The two neighboring regions, British Columbia and the US Northwest (the states of Washington and Oregon), have chosen two quite different paths regarding the mix between logs and lumber exports to Asia. The US has exported mostly softwood logs valued at about 77% of the total value of shipped logs and lumber the past few years, while Canada’s major export product has been softwood lumber, accounting for just over 75% of total exports in 2015 and 2016, reports the WRQ (www.woodprices.com). Not surprisingly, a shift in destination for North American logs and lumber has occurred the past five years. For many decades, Japan was the major consumer of forest products from the US and Canada, but in 2011 China surpassed Japan as the major trading partner of wood products. In 2015, North American logs and lumber exported to China and Japan were valued at 1.9 billion dollars and 1.2 billion dollars, respectively. This “gap” between the two countries is likely to shrink in 2016. 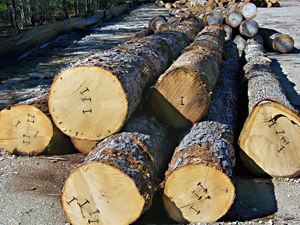 Wood Resources International LLC (WRI), an internationally recognized forest industry-consulting firm established in 1987, publishes two quarterly timber price reports and have subscribers in over 30 countries. The Wood Resource Quarterly, established in 1988, is a 52-page market report and includes sawlog prices, pulpwood and wood chip price and market commentary to developments in global timber, biomass and forest industry. The other report, the North American Wood Fiber Review, tracks prices of sawlogs, pulpwood, wood chips and biomass in most regions of Canada and the US.